This morning I was sitting in our sun room doing some reading while I had a cuppa. There was a sudden thud on the window near me – a sound we hear a little too frequently. Every few days we hear a bang on one of our windows. Unfortunately, some of our garden birds see the reflection of the garden in the glass of one of our windows, and mistakenly thinking they can fly straight ahead, come to a sudden, head splitting halt. Most birds suffer mild concussion briefly before flying off, a little sadder but hopefully wiser for the experience. The occasional one does not survive the impact. [Sigh]. 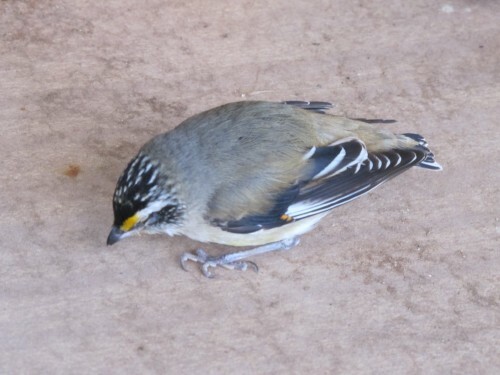 This little Striated Pardalote shown in today’s photo was the latest hapless victim. I picked him up and cradled him in my hands for a few minutes, showing off his beautiful colours to some visitors who happened to arrive during my rescue. I placed the bird on an outside table, took several photos and left him to recover. Within minutes it had flown off. I hope his headache didn’t last long. At this time of the year people throughout much of Australia are aware that the Australian Magpie is nesting. Some of our magpies are known to get very protective of the nest and the young. Getting swooped by a magpie seems to be a normal way of life in springtime Australia. For most people it can also be an unnerving experience at best and downright terrifying at worst. A magpie swooping at speed, often catching the unsuspecting victim from behind, can inflict a nasty cut. Those of us living in magpie territories learn to accept this as a part of spring and learn to even expect it. What you don’t always expect is a magpie – possibly a juvenile just out of the nest – sitting in the middle of the road in a suburban street. Especially at 11pm on a wet night. On Friday night I almost ran over such a bird. Luckily it had learned enough road sense to flap out of the way in time. The reality is sadly much worse than this. While that particular bird got out of harm’s way, many thousands of young magpies do not. Road kill of young magpies – and many other species too – account for a very high mortality rate. In fact, from memory, I think more than half of young magpies who manage to leave the nest die as road kill within the first twelve months. Sad, but true. Caring for injured and orphaned birds – click on this link to read how you can look after injured or orphaned birds you find. Strange things happen in the bird world from time to time. Stranger things sometimes happen in my world from time to time too. I was sitting on the back veranda reading the morning paper. I was suddenly aware of movement near my feet. I wild Galah casually walked past me, across the grass and went straight for the swamp… er… swimming pool. It leaned over looking for a drink, but the water level is just a little too low. She continued walking around the pool to the steps. She took quite and interest in the little ramp we installed a few weeks ago to allow some Pacific Black Ducklings to get out of the water before they drowned. (Yes – baby ducklings can drown due to hypothermia and having feathers that cannot repel water. They develop water resistance after a few weeks.) Said Galah, having tested out the ramp, walks down to the water’s edge for a good drink and then back to the bricks again. She then proceeded to walk out through a gap in the fence and off through the mallee scrub at the back of our house. As she left I noticed that one wing was drooping and obviously damaged. This morning Gertie was back – but this time she was floundering in the water. Several other Galahs had gathered on the pool edge to encourage her. She was quite soggy and I rescued her just in time. I wrapped her in a towel, put her in a cardboard box in the sun and hoped she would dry out. Within the hour she shrugged off the towel, climbed out of the box, preened her feathers and walked off towards the scrub again. This time the wing seemed to droop even more. At lunch time she was back, sitting on the water’s edge. I managed to approach close enough to throw the towel over her and catch her, making sure her sharp beak and claws were kept away from my tender fingers. Despite her loud, squawking protestations I managed to release her in an old aviary to keep her out of harm’s way. We have stray cats and foxes in the vicinity; it’s not safe out there for a wounded Galah who can’t fly more than about a metre. By this evening she had found the food I’ve put there for her and I hope she’ll also find the water. Even though wounded she was able to climb up the netting and find a perch. How did she become wounded? I suspect she’s been hit by a passing vehicle. The death rate of Galahs from road kill is incredibly high. In another part of town today I saw four dead Galahs in a 50 metre stretch of road. Other possibilities include a fox, dog or cat attack while feeding on the ground, flying into a power line or even a bullet wound. The photo above is of a free bird, not Gertie. I hope she quickly recovers so we can release her again. Update: Gertie obviously felt better after a few days. She managed to escape from my old aviary and we haven’t seen her since. I frequently get asked questions about caring for injured or orphaned birds. Some people leave their questions on an appropriate page of this site, while others ask their questions privately using my contact from here. I often explain to people with this questions that I am certainly no expert in this field. I have no experience and very little knowledge in looking after injured or orphaned native birds or animals. I usually try to direct them to relevant help from elsewhere. Every state of Australia has its rules and regulations as to what members of the public can and cannot do where helping injured wildlife is concerned. As a general principle, never try to look after an injured animal or bird unless you are skilled to do so and have the necessary permission from the relevant authorities in your state. The welfare of the animal or bird is most important: make sure that the bird is safe from further harm. Keep little children, cats and dogs away, handle it as little as possible and keep it in a strong, ventilated cardboard box. Contact or visit your local vet for advice. Some of my readers have been very disappointed with this course of action, stating that some vets are very dismissive and only recommend that the animal be destroyed. I find this response rather perplexing; I thought vets cared for animals. Use the Yellow Pages phone directory to find your nearest animal welfare and rescue organization. There are hundreds of skilled and trained carers across Australia and there is every likelihood there is one near you. Contact or visit your local pet shop: help coming from these people will also vary greatly. Some may be very willing to help, others only will help if there is a potential sale of goods involved. Visit your local library and ask for books on pet and animal care. Search on the internet: this is how I get so many requests for help. In some cases, people have said that this site was the ONLY place they found any information and help. That is not correct, but many people do not know how to effectively search the internet. Because of this I have prepared a list of useful Australian sites. Fauna Rescue of South Australia – while this is based here in SA, the information is useful throughout Australia, especially in regards to preparing food for injured animals. Caring for wildlife – a fact sheet produced by the Tasmanian Parks and Wildlife. Feeding advice for magpies – a fact sheet produced by the Bird Care and Conservation Society. Bird Care and Conservation Society – many fact sheets are available on this site. WIRES – Australian Wildlife Information Rescue and Education Service – includes contact details throughout NSW. Rehabilitating birds – and extensive article written by one of the experts at Healesville Sanctuary in Victoria. Always remember that the bird’s welfare is the most important thing to consider.